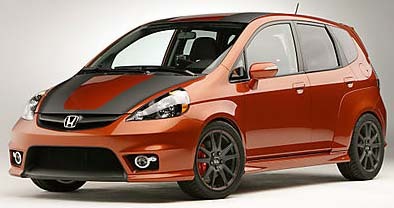 I purchased a Honda Fit Sport recently (manual transmission), an interesting move from my Escape Hybrid. I really liked the Hybrid around town, but it was an expensive vehicle and the majority of my current driving is on the highway. On the highway, the Escape is just like any other SUV in terms of wind resistance, etc. My monthly payments went down $100 after purchasing the Fit Sport, even after loading up on accessories and putting $0 down. It’s enjoyable to drive as long as you are not in a hurry. Even a Prius will beat you off the line and this car requires a bit of room to merge onto the freeway. The biggest enjoyment so far is the fuel economy; 34.5 mpg off my first tank. About 60% of my ‘in town’ driving is stoplight-to-stoplight and the remainder is on local freeways (speeds not exceeding 60mph). I’m a pretty conservative driver. I don’t do hypermiling, but when traffic conditions allow, I take my time getting from point A to point B with a focus on economy. So, my results are probably at the high end of expectations. In similar driving conditions, the Escape Hybrid was consistently getting 32.4 mpg. I have the orange color, but not the same wheels. Can’t wait to take it on a road trip.